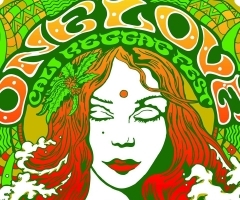 Last year, the One Love Cali Reggae Fest was born, and they were not messing around. The festival shocked Southern California by releasing a stacked lineup, that had all reggae lovers flocking to The Santa Ana Observatory for a full day of music and dancing. This year, they outdid themselves – times three. 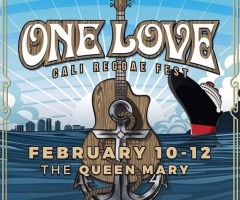 Due to the huge turnout from the year before, the One Love Fest moved to a new location: right alongside the shores of the Long Beach harbor, sharing a home with the majestic and famous Queen Mary. Not only this, but the festival also grew into a three-day event. 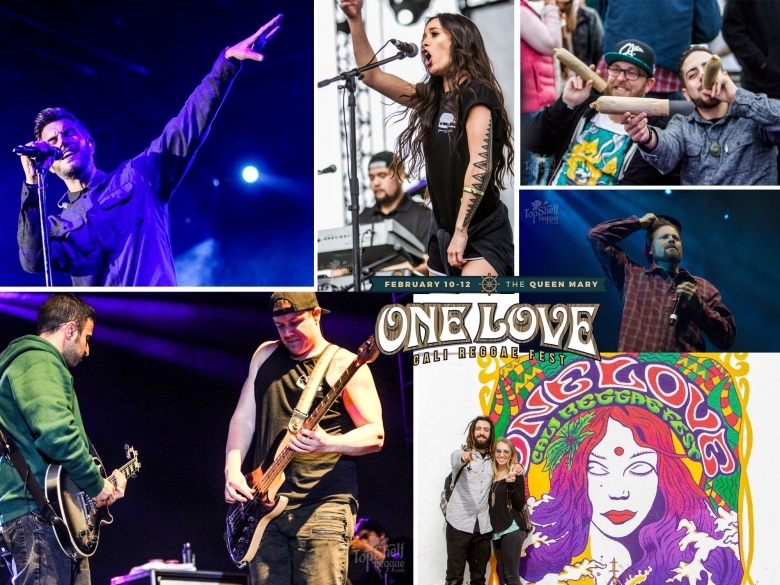 All three days included a dream lineup that had a little something for everyone; whether you are a fan of island reggae, roots reggae, reggae-rock, ska, or even hip-hop and punk, the 2nd Annual One Love Fest covered it all! Rumors of rain on the first day did not stop festival-goers from arriving early to start the vibes off right with bands like White Glove Service, Ital Vibes, and Arise Roots. 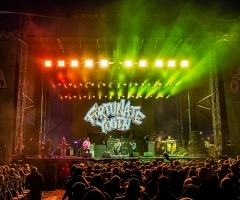 This was a special day for Fortunate Youth fans, because not only did they put on a killer performance, but it was also the same day that they released their latest self-titled album. They played new songs off the album like “Left My Love in California”, and had the crowd singing along to classic hits like “Burn One” and “Love is the Most High”. The band’s charismatic personalities always make their shows feel like one big backyard party. By this time, the rain was in full force, and, come to find out, there is just something special about dancing to live music in the rain. Next up was Stick Figure, who had one of the most memorable performances of the weekend. They ended their set with a cover of “Coco de Rasta” by Alpha Blondy as a tribute to their beloved tour dog, Cocoa, who is front and center stage at every show. HIRIE, who performed earlier in the day, came back out to sing a verse and they even added a horn section just for the cover! Heavy hitters and GRAMMY-nominees, SOJA, followed by headliners Slightly Stoopid ended the day with high energy, feel-good performances that made hanging out in the rain all day that much more worth it. The sun came back out just as we arrived for Day Two. And, what better way to start a day than with GRAMMY-nominees, Raging Fyah? Unfortunately, their set had to be cut to 15 minutes for reasons unknown, but it was easily my favorite 15 minutes of the day. Later, the band War came out and put smiles on the entire crowd. They paid tribute to the legend Bob Marley by covering the song “Get up, Stand Up”, and had everyone dancing and singing along to some of their classics like “Why Can’t we be Friends” and “Lowrider”. It’s hard to stand still after hearing their soulful voices, funky bass lines, and catchy saxophone solos. Next up was Chronixx, followed by Protoje on the opposite stage. It is apparent that these young artists from Jamaica carry themselves with an old soul. This is one thing that makes watching them perform so unforgettable, and why their music has been coined as a ‘reggae revival’. The legendary and best-dressed man in the business, Don Carlos, even gave them a shout during his performance later that evening. Raging Fyah weren’t the only ones that day with a GRAMMY nominations: J Boog opened his set with the first track off his latest album, Wash House Ting, titled “Nuh Wan Dat”, setting a tone of intense positivity and love that continued throughout his set. After much anticipation, Rebelution came on to close out the night. The high energy of their set could be felt from all corners of the venue. Rebelution fans got to enjoy songs off some of their oldest records as well as their most recent album, Falling Into Place. Both this album and J Boog’s Wash House Ting were in the running for “Best Reggae Album”. The last day of the festival started with an impressive set by Iya Terra. The conscious messages rooted in their music resonated with the crowd, and set a positive vibe for the rest of the day. More bands from Day Three included Perro Bravo, The Ziggens, and LB Dub Allstars who all worked with and were close, personal friends with Long Beach locals, Sublime. You could feel the spirit of Bradley Nowell in the air. Bob Marley may not have been able to make it to the festival either, but The Wailers gave a performance with songs from the album, Legend, that reminded us who started this movement called ‘reggae music’. This was followed by a powerful set from Steel Pulse, a band that has also made a huge impact on reggae music and the world by preaching messages of love, justice, and peace through their art. The last performance of the weekend on the Queen Mary stage was a personal favorite, Mike Love. Mike simultaneously uplifted the crowd with inspiring messages while spreading knowledge about injustices in the world meant to open your mind and get you thinking about the things that really matters in life. The combination of that, mixed with his unbelievable vocals and guitar skills made for a truly magical performance. If you take all the different sounds and genres from the weekend and put them into one band, you get Dirty Heads. So that’s why they were the perfect fit to headline Day Three of the festival. The Dirty Heads put on a strong, multi-genre infused performance that could be felt and heard all the way from the parking lot. 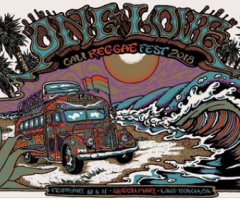 The 2nd Annual One Love Cali Reggae Festival brought people and bands from around the globe together for a weekend of good vibes and great music. Even though there were many different artists and performances throughout the weekend, they each had one thing in common: the goal of spreading positivity, and inspiring the masses with their gift of music. Top Shelf Reggae is already looking forward to next year’s event, and if you made it through this whole article, Jah bless!